Exit Through the Gift Shop the new film by Banksy… or is it? This film is a documentary about a documentary (Think a more meta version of Lost in la Mancha) that ends up questioning “what is art?” When Thierry Guetta, an amateur filmmaker if there ever was one, sets out to film Banksy after getting drawn into the world of graffiti and street art proves to be unable to produce a comprehensible film (we are shown Life, Remote Control: The Movie is either the most avant garde film ever made… or one of the biggest pieces of junk) Banksy then asks to recut the film, while Guetta tries his hand at street art in a reversal of roles. The film’s authorship problems come from the fact most of the film is constructed using footage shot by Thierry for his Life, Remote Control though he did not know how to make that movie… he simply felt life was worth recording, especially these under appreciated street artist. Banksy then takes Guetta’s footage to tell the “much more interesting” story of Thierry, and his quest to document street art… particularly the holy grail of elusive street artist’s Banksy himself. So we are watching Banksy interpret Thierry’s footage of other people’s street art, including his own… quite the trip. Then the really heady stuff begins. While framed as a documentary/biopic about this goofy guy Thierry, the film really plays around with the concept of “what makes art.” Around midway into the film, Thierry documents a art show featuring all work by Banksy, once Banksy charges Thierry to “do a small show” of his own, Thierry sets out to do a bigger show than Banksy in the finale… only to meet with the similar rabid appreciation by art collectors. 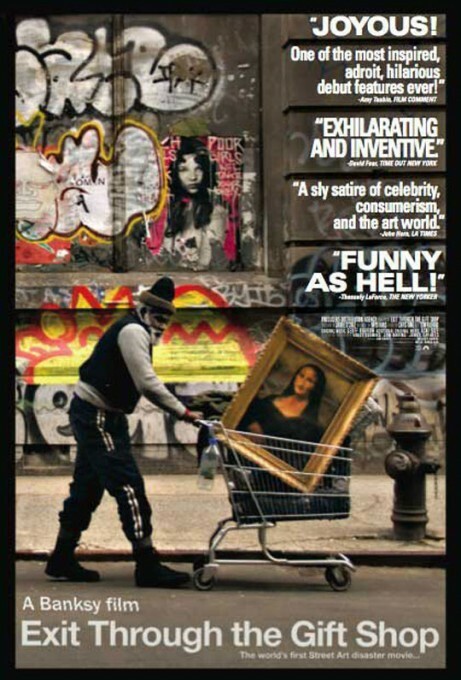 Throughout the film, art collectors are portrayed as clueless (“I don’t like this one but I have it hanging up anyway” says one collector, likely to flaunt it because of it’s “value.”) Banksy’s art vanishes the next day in some places, yet art critics claim he is a genius… if it is art why would it be so hurried to be removed? Why would Thierry be able to become an overnight sensation with such a little body of work (some including pictures of himself). Thierry gets a lot of laughs in this film, most of them with him, as he journeys into the mysterious world of street art. While I went into the movie thinking that the film would have little appeal outside street art enthusiasts and the elites who think Banksy is the only good street artist, Thierry as our guide into this world provides an everyman appeal of making the world palatable and humorous enough anyone can enjoy… and this everyman quality is also the reason the Thierry art show works so well… basically, he’s trolling the art establishment. And there’s where Banksy comes in… it is doubtful that Thierry would have been able to play around with the concepts of “what is art” as much as Banksy, a man who’s integrity is called into question after his art show. 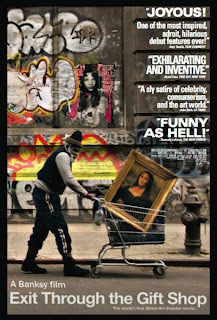 Whether or not, the movie is a “prank” or if Banksy is actually Thierry as is suggested by some internetz outlets, the film is enjoyable a) enjoyable to watch and b) raises some interesting issues surrounding the nature of art.